Maybe the name Charles de Lint is familiar to some of my readers. He has been a musician for some time now; in fact, that’s how he and his wife MaryAnn Harris met. But these are their first albums. If you know the name, it’s because Charles de Lint is well known for his fantasy novels. I first read him about twenty years ago, at my wife’s strong suggestion. De Lint is a fine storyteller. He has a knack for creating characters who might be flawed, but who you would want to spend time with. His tales tell of intersections and interminglings of our world and the worlds of Celtic and Native American myth. And I have read him in one other context: for about a year, de Lint wrote capsule reviews of Celtic folk albums for Dirty Linen magazine. So how would all of this translate into an album of original songs? I hoped that his gifts for story and character would make the journey from prose to the lyric form. I expected some variation on Celtic music. And I hoped this would be more than a vanity project, that the music would be really good. Well, the music is really good, but it’s not at all Celtic. Call it Americana or acoustic rock. There are three guitar players on Old Blue Truck, so I don’t know who plays lead, but there are some wonderful Spanish guitar solo lines in some of these songs. De Lint is one of the guitar players, and he also adds some wonderfully moody harmonica lines here and there. MaryAnn Harris plays mandolin and contributes background vocals that perfectly complement de Lint’s lead. Her echo on the chorus of Highway 105 is a highlight. A tight rhythm section of drums, bass, and rhythm guitar keeps everything moving along beautifully. There are two songs which have a Native American feel to go with the themes of their lyrics. These are Cherokee Girl and Medicine Road, and the band shows their versatility on both songs. On top of it all is de Lint’s voice. He sings in a weathered gravelly baritone, but the emotion of each song comes through loud and clear. Fittingly for a man who is a writer first, de Lint pronounces his words clearly. I usually work with a lyric sheet for my reviews, and I did so here, but I have never needed it less. The lyrics are everything I hoped they would be. Cherokee Girl is mostly a character sketch, and it is finely drawn indeed. Highway 105 is a tale of a road trip with a list of places in Ontario. De Lint the writer gives each place a distinct character in just one or two lines. As a bonus, the second verse has a list of Canadian musicians; I have featured some of them here, but now I will have to find out more about the others. The storytelling that I hoped for is here too. Bobby & Me tells of two boys and a terrible mistake, and does so with sympathy. 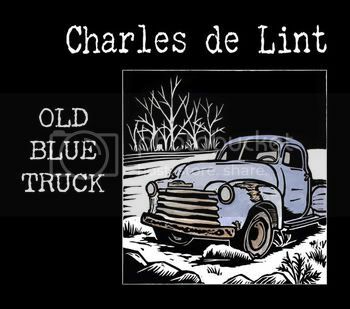 Old Blue Truck tells the story of a man’s life through the filter of his feelings about the rusted old truck his father once drove. In a lesser writer’s hands, this could quickly get maudlin, but de Lint tells the tale beautifully. Sam’s Song imagines the story of a dog who no longer has an owner. Although the dog reminds me of an animal spirit in a de Lint novel, there is nothing supernatural in the song itself. De Lint is willing to use supernatural elements elsewhere; The Lost Highway is a ghost story, and Medicine Road is actually taken from de Lint’s novel of the same name. But you do not have to read his books to enjoy this album. De Lint has done a fine job of making sure of that. The last song on the album is Save a Dance For Me. This is a beautifully rendered portrait of a man who has just lost his wife, after forty years of marriage; have some tissues ready when you listen to this one. So, as I said, I am an admirer of de Lint’s novels, and I want him to have all the time he needs to write more of them. But I also hope that he can find time to do another album. On the evidence of Old Blue Truck, it will be worth waiting for. Update: MaryAnn Harris wrote to let me know that Highway 105 is actually in the province of Quebec, not Ontario as I stated. 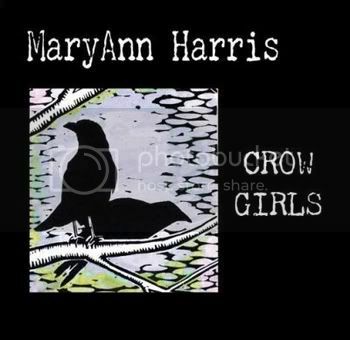 Crow Girls by MaryAnn Harris is a four-song EP. It was recorded in the same sessions as Old Blue Truck, and the plan had been to put all of this music on one album instead of two. But it makes sense to separate them, because Crow Girls is definitely its own thing. The feel of the music here leans into country more than the rock stylings of the de Lint album. The last track on Crow Girls. John McPhee’s Homestead, is a beautiful Celtic waltz written, like everything here, by Harris. Both albums have fiddle on them, but for Harris it is more of a featured instrument. And then there is MaryAnn Harris’ voice. As lead singer, she has a sweet alto with just a hint of a scratch. This works well for the sassiness of the title track, but equally well for the more tender In A Heartbeat. In mood, Sideways Turned Round is somewhere in between. Harris is a fine songwriter, but different from de Lint. Even though the Crow Girls are recurring characters in de Lint’s later novels, I can’t imagine him writing a song about them after hearing Harris’ title track. Her song has the raucousness of a chorus of crow calls, and also a wonderful sense of humor. She also works in the old rhyme about counting crows, to great effect. In a Heartbeat is a wonderful pledge of love, or perhaps I should call it a reaffirmation. Here is a woman who is been with same partner for quite a while. This is not the rush of new love. But sometimes we find a moment when realize that, with all the craziness in life, we are still in love. The quality of that love has changed, but it’s still there. Harris captures this feeling beautifully. She does not really tell stories with her writing, but she captures an emotion and a moment in time as well as any songwriter I know of. On Harris and de Lint’s website, there is a hint that Harris may do a full-length album next time. I hope so, but even if not, I will be looking forward to hearing more from her. Crow Girls left me high and breathless, sporting goosebumps and wanting more!